Mission Pinata Instant Win Game (MissionFoods.com/Pinata): Play Mission Pinata and you could instantly win one of 5,723 prizes including gift cards, coolers, headphones, and more. Over $45,000 in prizes so swing and win now. The Mission Pinata Instant Win Game is open only to legal residents of the fifty (50) United States and the District of Columbia (excludes Puerto Rico), who are eighteen (18) years of age or older at the time of Promotion registration. The Sweepstakes begins at 9:00:01 AM ET on April 1, 2019 and ends at 11:59:59 PM ET on May 5, 2019. Limit of one (1) Game play per person, per email address, per day, throughout the Promotion Period. The grand prize consists of a $500 AMEX gift card. 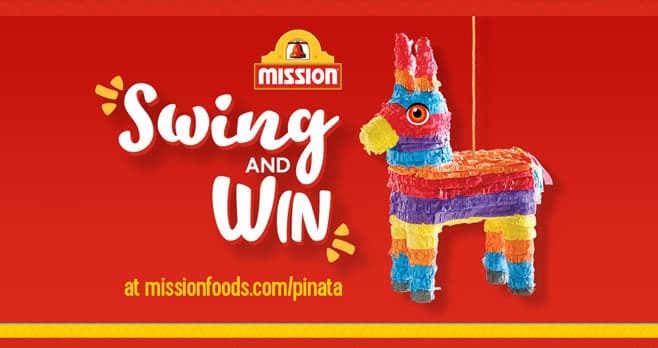 Visit www.missionfoods.com/pinata to enter and see Official Rules for details.